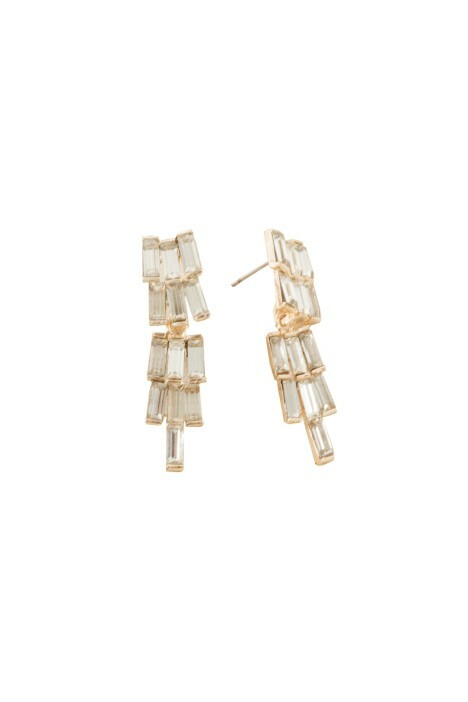 These stunning art deco inspired drop earrings features baguette shaped bevel cut crystals. This gorgeously designed tiered mini drop earring by Adorne is the perfect selection for your next evening gala ball or engagement party dinner. To compliment your earrings, rent the perfect accompanying floor length gown or perhaps a playful form fitted midi dress. Keep your look super chic with a soft updo to showcase the earrings and finish with a soft pink lip. For an extra glam look, add a pair of sparkling silver heels and a silver clutch pod available to hire. For more tips read our blog post on ‘Autumn Accessories: Our Style Guide’.